Downtown Detroit is the central business district and a residential area of the city of Detroit, Michigan, United States. Detroit is the major city in the larger Metro Detroit region. Downtown Detroit is bordered by M-10 (Lodge Freeway) to the west, Interstate 75 (I-75, Fisher Freeway) to the north, I-375 (Chrysler Freeway) to the east, and the Detroit River to the south. The city's main thoroughfare M-1 (Woodward Avenue) links Downtown to Midtown, New Center, and the North End. Downtown Detroit's skyline, as seen from Windsor, Ontario, Canada in June 2004. In recent years the downtown area has seen tremendous growth and redevelopment. Since 2000 a number of major construction projects have been completed including the new Compuware Headquarters at Campus Martius Park and two new stadiums: Comerica Park and Ford Field. General Motors moved their headquarters into the Renaissance Center, and the Detroit Lions have relocated from Pontiac to Downtown Detroit. High-profile events like the 2005 MLB All-Star Game, Super Bowl XL, and the 2006 and 2012 World Series have taken place in downtown, generating income for local businesses and spurring more growth. As a result, new residents are moving into Detroit in the assortment of new lofts that are opening. An example of these trends is the Westin Book-Cadillac Hotel. In 2006, the Cleveland-based Ferchill Group began the $180 million redevelopment of the historic Book Cadlliac Hotel at the corner of Washington Blvd. and Michigan Avenue. The project, which has been hailed by preservationists houses a 455-room Westin Hotel, 67 high-end condominiums, and two to three restaurants, and some miscellaneous retail serving hotel and conference center guests. DTE Energy Headquarters features an urban oasis of parks, walkways, and a reflecting pool. 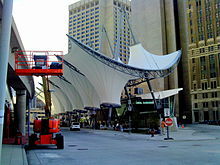 In 2007, Downtown Detroit was named among the best big city neighborhoods in which to retire by CNN Money Magazine editors. Downtown contains popular destinations including, the International Riverfront, the MGM Grand Detroit, Greektown Casino Hotel, and many sites listed on the National Register of Historic Places. Downtown Detroit hosts over 92,000 workers which make up about one-fifth of the city's total employment base; in addition, it is home to about 5,300 residents. Downtown offers a number of residential high rises, including Riverfront Towers, The Albert, and Town Residences. The Renaissance Center contains the Detroit Marriott hotel, General Motors headquarters, as well as many shops and restaurants. Compuware has its headquarters in the Compuware World Headquarters building by Campus Martius Park in Downtown Detroit. Compuware moved its headquarters and 4,000 employees to Downtown Detroit in 2003. Little Caesars and Olympia Entertainment have their headquarters in the Fox Theatre. Ernst & Young has offices in One Kennedy Square on Campus Martius Park. Pricewaterhouse Coopers has offices in a building across from Ford Field. Chrysler maintains executive offices at Chrysler House in the city's Financial District. In 2011, Quicken Loans moved its headquarters and 4,000 employees to downtown. Comerica Bank and Blue Cross Blue Shield of Michigan are also major employers downtown. St. Mary Roman Catholic Church in Greektown Historic District. The Elwood Bar and Grill is listed on the National Register of Historic Places and is within the Grand Circus Park Historic District. Separates the Renaissance Center from Greektown. Bricktown separates the Renaissance Center from Greektown. Bricktown is home to St. Peter and Paul's Catholic Church, the oldest standing church in Detroit, and the Italian Renaissance style Wayne County Building (which was saved from demolition in the early 1980s). The Wayne County Courthouse, once located in the Wayne County Building, was the place where Mae West was once a defendant on a charge of public indecency. Bricktown is notable for its live music venues. Jacoby's German Biergarten (1904), the city's oldest surviving pub, provides a small performance space for up & coming acts. St. Andrew's Hall is a venue for nationally touring acts, as is the Shelter in the basement of St. Andrew's. 42°20′6″N 83°2′46″W﻿ / ﻿42.33500°N 83.04611°W﻿ / 42.33500; -83.04611﻿ (Broadway Avenue Historic District) The Broadway Avenue Historic District is located along a single block of Broadway Avenue, and contains eleven commercial buildings built between 1896 and 1926. The area was developed in the late 1800s as a commercial area catering to the women's trade, and included businesses such as hairdressers, florists, corset makers, and fashionable clothiers. Three buildings in the district — the Cary Building, Harmonie Centre, and the Merchants Building — are individually listed on the NRHP. 42°19′53″N 83°2′48″W﻿ / ﻿42.33139°N 83.04667°W﻿ / 42.33139; -83.04667 Woodward Ave. Campus Martius is a historic district and central gathering place which contains parks, Woodward Fountain, the Michigan Soldiers' and Sailors' Monument, and a large traffic circle surrounded by commercial and residential high-rises including 1001 Woodward Avenue. Since the traffic circles restoration and expansion, it has emerged as a central gathering spot downtown with a mainstage. 42°19′58″N 83°2′58″W﻿ / ﻿42.33278°N 83.04944°W﻿ / 42.33278; -83.04944﻿ (Capitol Park Historic District) Capitol Park itself is a triangular plot of land (now a public park) bounded by Shelby Street, Griswold Street, and State Street. A courthouse was built in Capitol Park in 1823-28; when Michigan became a state in 1837, the building served as the state capitol. The Historic District includes the park and seventeen surrounding buildings for a block in each direction, including the Farwell Building, the Griswold Building, the David Stott Building, and the Industrial-Stevens Apartments. 42°19′46.36″N 83°2′50.43″W﻿ / ﻿42.3295444°N 83.0473417°W﻿ / 42.3295444; -83.0473417﻿ (Detroit Financial District) This is the historic financial district of Detroit which dates to the 1850s and contains prominent skyscrapers. Ornate skyscrapers in Detroit (including the Guardian Building, the Penobscot Building, and One Woodward Avenue), reflecting two waves of large-scale redevelopment: the first in 1900–1930 and the second in the 1950s and early 1960s. 42°20′10″N 83°3′2″W﻿ / ﻿42.33611°N 83.05056°W﻿ / 42.33611; -83.05056﻿ (Grand Circus Park Historic District) Grand Circus Park Historic District contains the 5-acre (2.0 ha) Grand Circus Park, bisected by Woodward Avenue. Notable buildings encircling the park include the David Broderick Tower and David Whitney Building on the south, the Kales Building, Comerica Park, the Fox Theatre, and the Detroit Opera House may be accessed from Grand Circus Park. St. John's Episcopal Church and the Central United Methodist Church are among the many churches and cathedrals on Woodward Ave.
Monroe Ave., between Brush and St. Antoine Sts. 42°20′6″N 83°2′32″W﻿ / ﻿42.33500°N 83.04222°W﻿ / 42.33500; -83.04222﻿ (Greektown Historic District) Greektown is a primarily commercial district that extends two city blocks. It includes St. Mary Roman Catholic Church, Second Baptist Church, separately listed on the Register, Greektown Casino Hotel, and the Athenium Suite Hotel. The district contains numerous restaurants and Greek-themed shops. East Jefferson Avenue runs eastward from Woodward Avenue along the International Riverfront which contains the Renaissance Center, a cruise ship terminal and dock, residential high rises, and a prominade of parks and marinas extending to Belle Isle. The University of Detroit Mercy College of Law is across from the Renaissance Center along Jefferson Avenue. The Detroit People Mover stops at the Renaissance Center along West Jefferson Ave.
West Jefferson Avenue runs westward from Woodward Avenue and beneath Cobo Center, before passing Joe Louis Arena, the Riverfront Condominiums and other sites along the Detroit International Riverfront extending to the Ambassador Bridge. 1202–1449 and 1400–1456 Woodward Ave.
42°20′3″N 83°2′56″W﻿ / ﻿42.33417°N 83.04889°W﻿ / 42.33417; -83.04889﻿ (Lower Woodward Avenue Historic District) The Lower Woodward Avenue Historic District contains thirty-four commercial buildings built at the end of the nineteenth century and the beginning of the twentieth, many by noted architects. It contains the downtown's historic street-side shopping district. 42°19′58″N 83°2′45″W﻿ / ﻿42.33278°N 83.04583°W﻿ / 42.33278; -83.04583﻿ (Monroe Avenue Commercial Buildings) The National Theatre (1911) at 118 Monroe Ave., the oldest surviving theatre in Detroit, is a part of the city's original theatre district from the late 1800s. Albert Kahn designed the theatre. 42°20′12″N 83°3′49″W﻿ / ﻿42.33667°N 83.06361°W﻿ / 42.33667; -83.06361﻿ (Park Avenue Historic District) In the 1920s, Detroit's prestigious Grand Circus Park was crowded with buildings and development began to spill north from Grand Circus Park up Park Avenue. In 1923, the Park Avenue Association was formed. They planned the street to concentrate high-grade commercial and office space at the south end, and prestigious residential development at the north end, much like New York City's Fifth Avenue. The district includes the Women's City Club, the Park Avenue House, and the Kales Building. 42°20′4″N 83°2′42″W﻿ / ﻿42.33444°N 83.04500°W﻿ / 42.33444; -83.04500﻿ (Randolph Street Commercial Buildings Historic District) Buildings along this section of Randolph Street have been used for retail since the area was first built up in the 1840s; the building at 1244 Randolph was built during the period of original construction. As the city grew, larger commercial buildings were required and the other structures on Randolph were constructed. Washington Boulevard, between State and Clifford Sts. 42°19′59″N 83°3′4″W﻿ / ﻿42.33306°N 83.05111°W﻿ / 42.33306; -83.05111﻿ (Washington Boulevard Historic District) This district includes the Book-Cadillac Hotel, the Book Tower, the Industrial-Stevens Apartments, and Washington Square (Trolley Plaza) among other architecturally significant buildings. The Detroit Statler Hotel was located on the boulevard until it was demolished in 2005. The street was broadened and ornamented in the early part of the twentieth century to resemble New York's Fifth Avenue and European boulevards. As of the 2010 Census, there were 5,287 people residing in the district. The population density was 3,671.5 people per square mile (1,417.6/km²). There were 4,572 housing units. The census reported the district residents as 63.6% Black, 28.2% White, 4.0% Asian, 0.5% Native American, 0.6% other races, 3.0% two or more races, and 3.3% Hispanic. As recently as 2011 the population of full-time residents in Downtown Detroit was relatively low. However, its population grew by an estimated 15 percent between 2012 and 2016 as it experienced a construction boom. The city of Detroit offices are located in the Coleman Young Municipal Building. The Guardian Building serves as headquarters for Wayne County. Detroit Fire Department has its headquarters in Downtown Detroit. The Detroit Police Department has its headquarters in Downtown Detroit. The Central District patrol division of the police department serves Downtown Detroit. Federal offices are in the Patrick V. McNamara Federal Building. They include an FBI field office. The Detroit Greyhound Lines station is directly west of Downtown along the John C. Lodge Freeway. The Detroit Department of Transportation system provides mass-transit by bus. The Rosa Parks Transit Center, completed in 2009, serves as the main hub for the bus systems downtown. It is adjacent to two stops on the Detroit People Mover. The People Mover, a 2.94-mile (4.7 km) automated rail rapid transit system, operates on a single-track, one-way loop through the downtown area. Suburban Mobility Authority for Regional Transportation has its headquarters in the Buhl Building in Downtown Detroit. In late July 2014, construction began on the M-1 Rail Line which, upon completion planned for mid 2017, will run 3.3 miles on Woodward Avenue from Congress Street in Downtown Detroit to the Grand Boulevard station in New Center. Companies with headquarters in Downtown Detroit include Compuware, Dickinson Wright, General Motors, Little Caesars, Campbell-Ewald, Miller Canfield, and Quicken Loans. October 28, 2014, Fifth Third Bank announced plans to move its Michigan regional headquarters from Southfield to downtown Detroit in what will be named the Fifth Third Bank Building at One Woodward. The bank will occupy about 62,000 sq ft (5,800 m2) of the structure and has also pledged to invest $85 million in the city of Detroit. The office had 150 employees. Previously Comerica Bank had its headquarters in Downtown Detroit. On March 6, 2007, the company announced its decision to relocate its corporate headquarters to Dallas. The company executives began moving to Dallas in November 2007. At one time Real Times Media, the owner of black newspapers in the United States, had its headquarters in the Globe Tobacco Building, and later the Buhl Building. The building where the Detroit News and Free Press were previously headquartered. The Detroit Media Partnership, housing both The Detroit News and the Detroit Free Press, has its headquarters in Downtown Detroit. The Metro Times was previously headquartered in the Detroit Cornice and Slate Company Building in Downtown. Downtown Detroit has seen a major growth in entertainment  in the past decade. Campus Martius Park is open year-round, with ice skating in the winter with a huge Christmas tree display, to a large fountain and many concerts in the summer. Downtown Detroit has also seen major growth in retail, such as Michigan-based Moosejaw outdoor clothing. In December 2012, the largest Buffalo Wild Wings in the country opened in the district, and a new mixed-use development by CEO Dan Gilbert, businessman, and developer, The Z, due to its Z-like shape, with 1,300 parking spaces, artwork, LED lighting, and 33,000-square-feet of street level retail space. The Z is full of murals and other artwork from 27 international artists, and the floors are color-coded. The Z opened on January 30, 2014. On December 10, 2014, Punch Bowl Social opened a new 24,000-square-foot bi-level eatery and entertainment complex in The Z structure. The University of Detroit Mercy School of Law is located downtown across from the Renaissance Center. Wayne County Community College District (WCCCD) has its headquarters in Downtown Detroit. The Downtown Campus of the district is located adjacent to Downtown Detroit and adjacent to the WCCCD headquarters. Wayne State University is located in Midtown Detroit. The Corktown Campus, near downtown at 2700 Martin Luther King Jr. Boulevard, houses the University of Detroit Mercy School of Dentistry and Dental Clinic. The main campus of the University of Detroit Mercy is located uptown. The Detroit College of Law was in Downtown Detroit until 1997. It moved to East Lansing, Michigan in 1997 and is now known as the Michigan State University College of Law. The Detroit Public Schools, charter schools, and private schools serve city residents. Downtown residents enrolled in the public school system are zoned for Martin Luther King High School. Some downtown residents are zoned for Burton K-8 for elementary school, while others are zoned to Chrysler Elementary School. Burton K-8 and Bunche K-8 serve portions of Downtown for Middle School. Previously Dewey K-8 served portions of Downtown Detroit for elementary school. Previously Miller Middle School, and Duffield Middle School served portions of Downtown Detroit. Previously Murray-Wright High School served Downtown Detroit for high school. The Archdiocese of Detroit lists a number of primary and secondary schools in the city, along with those in the metro area. There are 23 Catholic high schools in the Archdiocese of Detroit. Of the three Catholic high schools in the city, two are operated by the Society of Jesus and the third is co-sponsored by the Sisters, Servants of the Immaculate Heart of Mary and the Congregation of St. Basil. The Detroit Public Library operates the Rose and Robert Skillman Branch Library downtown at 121 Gratiot with the library headquarters located in Midtown. The downtown branch first opened January 4, 1932. Skillman received its current name after the Skillman Foundation donated to the library system. Two consulates are located in the Renaissance Center; the Consulate-General of Japan, Detroit is located on the 16th Floor of the 400 Tower, and the Consulate-General of Canada in Detroit is located in Suite 1100 of the 600 Tower. The Consulate of Italy in Detroit is located in Suite 1840 in the Buhl Building. The Consulate of Mexico in Detroit is located in Suite 830 in the Penobscot Building. ^ Bigda, Carolyn, Erin Chambers, Lawrence Lanahan, Joe Light, Sarah Max, and Jennifer Merritt.Detroit Best place to retire: Downtown Archived December 14, 2012, at the Wayback Machine. CNN Money Magazine. Retrieved on October 22, 2007. ^ Snell, Robert. "GM CEO Henderson to give update on restructuring Friday." The Detroit News. Thursday April 16, 2009. Retrieved on April 20, 2009. ^ "Directions to Compuware Headquarters Archived October 14, 2009, at the Wayback Machine." Compuware. Retrieved on November 2, 2009. ^ "Decade in review: Business." The Detroit News. December 31, 2009. Retrieved on January 7, 2010. ^ "About Us Archived 2010-01-07 at the Wayback Machine." Olympia Entertainment. Retrieved on November 2, 2009. ^ "Franchise Opportunities." Little Caesars. 5/5. retrieved on November 2, 2009. ^ Hunter, George and Mike Wilkinson. "Detroit's deadliest neighborhood" (Archive). The Detroit News. September 2, 2011. Retrieved on July 2, 2015. ^ "Fire Department Archived 2009-02-26 at the Wayback Machine." City of Detroit. Retrieved on November 2, 2009. ^ "Police Department." City of Detroit. Retrieved on November 2, 2009. ^ "Central District Location." Detroit Police Department. Retrieved on November 2, 2009. ^ "Detroit Division." Federal Bureau of Investigation. Retrieved on June 9, 2015. "477 Michigan Ave., 26th Floor Detroit, MI 48226"
^ "Detroit, Michigan." Greyhound Lines. Retrieved on May 4, 2009. ^ "Contact SMART." Suburban Mobility Authority for Regional Transportation. Retrieved on November 11, 2009. ^ Gallagher, John (28 July 2014). "M-1 Rail construction kicks off on Woodward". Detroit Free Press. Retrieved 28 July 2014. ^ "Contact Us." (Archive) Compuware. Retrieved on November 23, 2013. "Compuware Corporation World Headquarters 1 Campus Martius Detroit, MI 48226"
^ "Home." () Dickson Wright. March 4, 2000. Retrieved on November 23, 2013. "Dickinson Wright PLLC Counsellors at Law 500 Woodward Avenue, Suite 4000 Detroit, Michigan 48226-3425"
^ "Dickinson Wright gaming practice enters Europe with law firm agreement in Bulgaria." Crain's Detroit Business. November 12, 2013. Modified November 13, 2013. Retrieved on November 23, 2013. "Detroit-based law firm Dickinson Wright PLLC announced Tuesday a cooperation agreement with Velchev & Co., a law firm based in Sofia, Bulgaria." ^ "Dickinson Wright renews One Detroit Center lease." Crain's Detroit Business. December 3, 2007. Retrieved on November 23, 2013. ^ Haglund, Rick. "GM sales chief Mark LaNeve leaving; headquarters to remain at Renaissance Center in Detroit." (Archive) 'MLive. October 7, 2009. Retrieved on November 23, 2013. ^ "Franchise Opportunities." (Archive) Little Caesars. 5/5. Retrieved on November 2, 2009. "2211 Woodward Ave. • Detroit, MI 48201"
^ "Offices." (Archive) Miller Canfield. Retrieved on November 29, 2013. "Detroit 150 West Jefferson Suite 2500 Detroit, Michigan 48226". ^ "Contact Us." (Archive) Quicken Loans. Retrieved on November 23, 2013. "Quicken Loans - Main Office - Compuware 1050 Woodward Avenue Detroit, MI 48226"
^ Pinho, Kirk (28 October 2014). "Fifth Third Bank to move 150 employees downtown as part of $85M investment in Detroit". Crain's Detroit Business. Retrieved 2014-10-28. ^ Gallagher, John. "Fifth Third Bank to move to downtown Detroit" (Archive). Detroit Free Press. October 27, 2014. Retrieved on November 27, 2015. ^ "Comerica Corporate Profile." () Comerica Bank. November 22, 2003. Retrieved on November 23, 2013. "Accessing Comerica Comerica Tower at Detroit Center 500 Woodward Ave., MC3391 Detroit, Michigan 48226 "
^ "Company Press Release" (Archive) Comerica Bank. March 6, 2007. Retrieved on November 23, 2013. ^ Hethcock, Bill. "Large ad agency cites area's vibrancy in decision to return." Dallas Business Journal. December 9, 2007. p. 2. Retrieved October 17, 2010. "In August, Comerica Inc. announced it would move into the skyscraper, formerly known as Bank One Center, when the banking and financial firm relocated its headquarters from Detroit. Comerica leased five floors -- 164,000 square feet -- and the building was renamed to reflect its new lead tenant. Comerica executives began moving in last month." ^ "Home." () Real Times Media. June 17, 2007. Retrieved on December 11, 2013. "Headquarters: The Globe Building • 407 E. Fort Street • Suite 410 • Detroit, MI • 48226 "
^ "Home." () Real Times Media. December 3, 2007. Retrieved on December 11, 2013. "Headquarters: The Buhl Building • 535 Griswold Street • Suite 1300 • Detroit, MI • 48226 "
^ "Contact Us." (Archive) Detroit Media Partnership. Retrieved on January 1, 2014. "Mailing Address Detroit Media Partnership 615 W. Lafayette Blvd. Detroit, MI 48226"
^ "FAQs." Metrto Times. March 19, 2011. Retrieved on January 1, 2014. "Metro Times 733 St. Antoine Detroit, MI 48226"
^ Firsts and facts Archived May 1, 2008, at the Wayback Machine Detroit Tourism Economic Development Council. Retrieved on July 24, 2008. ^ Arts & Culture Detroit Economic Growth Corporation. Retrieved on July 24, 2008. "Detroit is home to the second largest theatre district in the United States." ^ "Punch Bowl Social opens today in Detroit; here's a sneak peek". ^ Homepage. Wayne County Community College District. Retrieved on November 11, 2009. ^ "Downtown Campus." Wayne County Community College District. Retrieved on November 11, 2009. ^ "Elementary School Attendance Areas." Detroit Public Schools. July 10, 2003. Retrieved on November 2, 2012. ^ "Middle School Attendance Areas." Detroit Public Schools. July 10, 2003. Retrieved on November 2, 2012. ^ "Middle School Boundary Map." Detroit Public Schools. Retrieved on November 7, 2009. ^ "High School Attendance Areas." Detroit Public Schools. July 10, 2003. Retrieved on November 2, 2012. ^ "Detroit Catholic high school "sees God in the challenges" [Education Report]". Educationreport.org. Retrieved August 15, 2012. ^ a b "Archdiocese of Detroit – Schools". Aodonline.org. Retrieved July 1, 2010. ^ "About | Detroit Cristo Rey High School". Detroitcristorey.org. Archived from the original on February 11, 2010. Retrieved August 15, 2012. ^ "Skillman Branch Library." Detroit Public Library. Retrieved on April 19, 2009. ^ "Location Archived 2010-01-06 at the Wayback Machine." Consulate-General of Japan, Detroit. Retrieved on February 1, 2009. ^ "Office Location." Consulate-General of Canada in Detroit. Retrieved on February 1, 2009. ^ "Welcome to the web site of the Consulate of Italy in Detroit." Consulate of Italy in Detroit. Retrieved on February 1, 2009. ^ "Bienvenidos." Consulate of Mexico in Detroit. Retrieved on February 1, 2009. Metzger, Kurt and Jason C. Booza. "Reality vs. Perceptions An Analysis of Crime and Safety in Downtown Detroit" (Archive). Created for the Detroit Metro Convention & Visitors Bureau by Wayne State University and the Michigan Metropolitan Information Center. June 14, 2005. Wikivoyage has a travel guide for Detroit/Downtown.